We’d love your help. Let us know what’s wrong with this preview of Mendocino Fire by Elizabeth Tallent. The triumphant, long-awaited return of a writer of remarkable gifts: in this collection of richly imagined stories—her first new work in twenty years—the master of short fiction delivers a diverse suite of stories about men and women confronting their vulnerabilities in times of transition and challenge. Beginning in the 1980s, Elizabeth Tallent’s work, appeared in some of The triumphant, long-awaited return of a writer of remarkable gifts: in this collection of richly imagined stories—her first new work in twenty years—the master of short fiction delivers a diverse suite of stories about men and women confronting their vulnerabilities in times of transition and challenge. Beginning in the 1980s, Elizabeth Tallent’s work, appeared in some of our most prestigious literary publications, including The New Yorker, Esquire, and Harper’s. Marked by its quiet power and emotional nuance, her fiction garnered widespread praise. To ask other readers questions about Mendocino Fire, please sign up. when will the book be shipped? Relationships have the potential for tremendous complexities and complications, which is why they're such valuable literary fodder. In her newest collection of stories, Mendocino Fire , Elizabeth Tallent mines these challenges as they arise among family members, romantic partners, and others, and proves nothing is as simple as it seems. Not every story worked for me, as I found that some of them tried to cram too many disparate ideas together, but there were some stories I'd rate this 3.5 stars. Not every story worked for me, as I found that some of them tried to cram too many disparate ideas together, but there were some stories that absolutely knocked me out. My favorites included, "Tabriz," in which a man watches his life begin to unravel when he unearths an expensive rug at a dump; "Briar Switch," chronicling a woman's return home in the midst of a blizzard upon learning that her estranged father is close to death; "Never Come Back," which follows a man whose good intentions complicate his family's life in numerous ways, time and time again; "The Wrong Son," about a young man's complicated relationship with his taciturn father; and my favorite story in the collection, "Nobody You Know," which tells of a woman's struggles following her divorce, and what occurs upon her return home. "She could swear that an enthralled reader nineteen years old is the most beautiful animal on earth—at least, she's seen one or two who were, in their spellbound moment, the incarnation of extremest human beauty. They were not themselves. Literature looked back at her from their eyes and told her certain things she was sure they ought not to have understood at their age." Tallent's, well, talent, is evident throughout this collection, and I'm now interested in reading some of her earlier work. I've been fortunate to find so many short story writers whose work I've enjoyed this year, and I'm happily adding Tallent to that list. Read my full thoughts on this and other books over at Read.Write.Repeat. Tallent's collection reminded me of the beauty of writing and the skill needed to capture characters without the benefit of hundreds of pages of dialogue and decisions. Her writing is absolutely beautiful, if a bit mired down at times by the theoretical. There isn't a lot of action, but this isn't that type of book. To truly enjoy Tallent's writing, you have to be willing to devote some of yourself to it. This is one of thos Read my full thoughts on this and other books over at Read.Write.Repeat. These are beautiful and complex stories. I listened to them while taking long walks and my plan is to go buy the book to read them again. The last story, particularly the last line of the last story....will stay with you. These are beautifully crafted stories, each one a perfect slice of experience, each character carefully wrought, each setting almost photographically depicted. The last story, about the death of an estranged parent, was haunting. A remarkable collection. I would have given this book of stories 3 1/2 stars if I'd been able. Some of the stories are great. However, this was a difficult book to get through because the prose kept getting in the way of the story. The writing was generally beautiful, but I felt like the sentences were drawn up to make the reader think "wow, what a sentence" rather than move the story forward. Mendocino Fire by Elizabeth Tallent is a very highly recommended collection of ten short stories. The stories capture relationships and lives during times of transformation with clarity and insight into the complicated emotional landscape of all relationships. Tallent explores relationships between genders, with an emphasis on female relationships, as well as broken marriages. Many of the stories deal with creative people, writers, artists, or ecological/environmental activists. 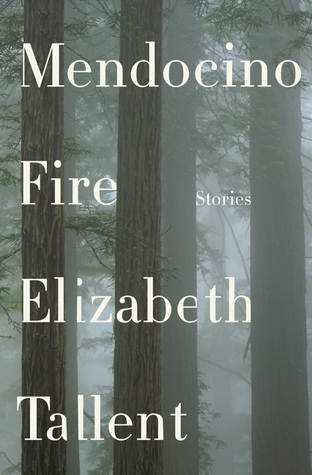 Several are set o Mendocino Fire by Elizabeth Tallent is a very highly recommended collection of ten short stories. The stories capture relationships and lives during times of transformation with clarity and insight into the complicated emotional landscape of all relationships. Tallent explores relationships between genders, with an emphasis on female relationships, as well as broken marriages. Many of the stories deal with creative people, writers, artists, or ecological/environmental activists. Several are set on university campuses or have a tie in to academia. Almost all of the stories involve exes, severed relationships, struggling relationships. The emotions run high as we hear the inner thoughts of the characters struggling to make sense of their lives, actions, obsessions, and circumstances. Tallent describes lives that are messy, with emotional fallout and struggles. All of these stories are extremely well written with exceptionally descriptive prose and phrasing. There are several passages I marked to take note of in my advanced reading copy. Tallent manages to capture the inner thoughts of her characters and their feelings with a clarity of emotion that is complete and realistic, but with a poetic grace and beauty of wording that often belies the raw emotions being expressed. Or: "It can't be true that she can't see in. That she can't know the story. This is her life she's been shut out of!"(pg. 97) And on the next page "Divorce is not linear. One morning there is peace of mind, the next there is wrath." Ten stories exploring the labyrinth and intricacies of relationships. Examining an array of issues plaguing relationships, Tallent left no stone unturned. Tallent demonstrates her understanding of diversity and imagination in each story. Her writing style is distinctive, a mix of intimacy and distance as you enter her protagonists mind, along with a subdued stream of consciousness with part heart ramblings. This patchwork style permits the reader to empathize with characters stirring evocative m Ten stories exploring the labyrinth and intricacies of relationships. Examining an array of issues plaguing relationships, Tallent left no stone unturned. Tallent demonstrates her understanding of diversity and imagination in each story. Her writing style is distinctive, a mix of intimacy and distance as you enter her protagonists mind, along with a subdued stream of consciousness with part heart ramblings. This patchwork style permits the reader to empathize with characters stirring evocative moments. There is a rawness with a bit of an artsy edge to her stories, yet plausible. Whatever label I am failing to assign to Tallent's style, her stories are memorable and will leave readers contemplating. An eclectic variety of thorny examinations into relationships in a distinguishing literary voice, you will revere Tallent's endeavor. I think this collection puts her in a league of short story writers with Grace Paley and Alice Munro. The sentences, the images, the characters -- so full despite the economy of language -- are really masterful. I'm so glad this was suggested to me. Elizabeth Tallent is an incredible storyteller. This long-awaited collection, like her earlier work, is vividly imagined and wonderfully nuanced. I'd give this a 3.5. Complicated lives and relationships are the focus of these stories; an estranged daughter rushing home in a snowstorm to see her father before he dies; a child raised in uncertain circumstances who becomes an environmental activist; a couple whose new marriage falters because of a rug and a surprise announcement, a brief love affair between two writers. I want to give this book 3.5 stars. Intense, beautiful writing. The most affecting stories in this collection, to me, serve as a lyrical & compelling meditation on the ways that infidelity & divorce leave a mark - or even ravage - a woman’s headspace. too hard a read for me at this time; took too much work to get through a story. Ugh. Maybe she has a better set of short stories or maybe Elizabeth Tallent has a great novel in her, but I stopped reading about two-thirds the way through this collection. She has real talent but a propensity to blow up perfectly grounded tales with hard plot twists and characters acting completely out of their norm. Most of the stories are built the same way: humanistic initial set-up, realistic interaction between characters, sound observations about normal life for (usually) poor people, mo Ugh. Maybe she has a better set of short stories or maybe Elizabeth Tallent has a great novel in her, but I stopped reading about two-thirds the way through this collection. She has real talent but a propensity to blow up perfectly grounded tales with hard plot twists and characters acting completely out of their norm. Most of the stories are built the same way: humanistic initial set-up, realistic interaction between characters, sound observations about normal life for (usually) poor people, moments that would be absurd if they didn't feel so real, then a complete left turn in the third act that toppled all the goodwill built up before. "Left turn" means many things here, but usually it came down to a character acting completely out of character and in a counter-intuitive fashion. Maybe it was during the incredibly quick attraction of two women flirting and kissing in front of one's husband (and the other's former husband) in "Nobody You Know," maybe it was a father leaving his grandson completely alone with the mom who abandoned the kid five years prior (who then promptly runs AGAIN with the child) in "Never Come Back," or maybe it was the rug incident in "Mystery Caller," but every third act turn felt so unnatural, so completely out of nowhere, and I began to feel that Tallent's talent is building up stories, but she has no patience to land them softly or smoothly, preferring chaotic final acts. Left turns are fine, but everything within this book felt like an attempt for each story to have a "moment." Unfortunately each swerved into melodrama rather than keep them grounded as they were at the start. This collection of stories is like a gorgeous, masterfully-crafted sculpture that you find out is a cake, baked for you, meant to be eaten. Some stories you savor, some you devour, all are exquisite. I am so glad this book exists. Tallent writes, "though she rushes toward it unknowing...to fly toward him when he is already dead is the most desolating, and she has no means of ruling it out." And so it goes in Mendocino Fire. In each of these short stories characters face critical life moments while the writing keeps their motivations, emotions and personalities at arms length - if they are there at all. There are two kinds of people in this book - career academics who seem to be in a constant state of emotional dissatisfact Tallent writes, "though she rushes toward it unknowing...to fly toward him when he is already dead is the most desolating, and she has no means of ruling it out." And so it goes in Mendocino Fire. In each of these short stories characters face critical life moments while the writing keeps their motivations, emotions and personalities at arms length - if they are there at all. There are two kinds of people in this book - career academics who seem to be in a constant state of emotional dissatisfaction and non-academic who folks who act inexplicably. One reviewer writes, "The characters in these stories... are no match for Tallent...who shows herself to be quite deft at throwing monkey wrenches into the machinery of complacence." For the degree of effort Tallent puts into her writing - pages of dense prose with hardly a breath in between, instants described with adjective layered upon adjective, one wishes those words had created characters whose essential humanity, quirks and personalities were far more present. Characters with the strength to throw that monkey wrench right back at Tallent and say: I'm not doing that -- you've created a cipher out of me and I refuse to be manipulated any more. Perhaps these stronger, more robust characters could have truly been present for the scenes Tallent creates. She has an ability to craft unforgettable images, but her characters' lack of depth leave you feeling as dissonant as one of her unsure academics. Tallent has shared her view of people in this world by sketching her characters out of categories. It makes one wonder how much she has experienced of the people she writes about -- and wish that perhaps if she were more fearless about interacting with the people in her world her characters would truly have the power she is trying to instill in them. There is a sense of narrative distance that simultaneous makes me feel disconnected from the story yet draws me deeper into the characters' emotional conflict. The stories in Mendocino Fire don't give us direct insight into the narrators' minds. Instead, the narrators seem to observe the situations they find themselves in and comment on what is happening. The simplicity of the narration serves only to heighten the emotional tension by cutting away any excess that would take away from the story's There is a sense of narrative distance that simultaneous makes me feel disconnected from the story yet draws me deeper into the characters' emotional conflict. The stories in Mendocino Fire don't give us direct insight into the narrators' minds. Instead, the narrators seem to observe the situations they find themselves in and comment on what is happening. The simplicity of the narration serves only to heighten the emotional tension by cutting away any excess that would take away from the story's focus. It can be a challenge working through these stories. A lot of pronouns are used, so it was difficult at times for me to figure out to whom the narrator was referring. There are also time skips without an immediate explanation for what is happening or what has happened in the duration. Much is left to the reader to decipher the text. That's one of the beauty of short stories though. They're meant to be read and reread with new meaning drawn from the text with each reading. Mendocino Fire won't be for everybody. It's deep, dense, and complicated. It isn't something that I would pick up for a casual read (though I can think of some people who would do just that). Nevertheless, I can see myself returning to one of these stories when I'm looking for a story that explores the depths of human nature, relationships, and conflicts. I really responded to "Narrative"--but found the tone of some stories, like "Mendocino Fire" and "The Wrong Son" discordant: as if Tallent had been advised to add some action to her stores. On the opposite end, "The Wilderness" and "Briar Stick" were really difficult to get through--dense, heady, and at times obtuse. An uneven collection from a clearly talented writer (no pun intended, lord). I don't generally like short stories. They tend to feel the wrong length to me: too thin or crammed, too short to attach to or too long for their subject. I thought these were beautiful. Her characters are vivid, their flaws and foibles undeniable, but all treated with an uncynical humanity. She has a Woolfian manner of filling in worlds between the bits of a real-time conversation, which may not be for everyone, but is in my literary sweet spot. And, she has a knack for finding the perfect word I don't generally like short stories. They tend to feel the wrong length to me: too thin or crammed, too short to attach to or too long for their subject. I thought these were beautiful. Her characters are vivid, their flaws and foibles undeniable, but all treated with an uncynical humanity. She has a Woolfian manner of filling in worlds between the bits of a real-time conversation, which may not be for everyone, but is in my literary sweet spot. And, she has a knack for finding the perfect word, maybe one you haven't heard in a while. Anyway, this is a melancholy, wistful book: "Can you go years without thinking of someone you once loved? It makes a life seem very long." Too many stories in this collection are tedious, but I was particularly moved by "Mystery Caller" and "Nobody You Know." "Tabriz" is a surprise, and there's a poignant head-against-the-hospital-wall-while-talking-on-the-phone scene in "The Wrong Son" that stung me with its clarity and pain. I liked "Never Come Back," but I always feel like I'm doing it wrong when I don't connect to the title story, and "Mendocino Fire" made me tired. Short story collection, quite varied. Realistic style, often of Cali coast characters struggling - divorce, failed relationships, unwanted pregnancies, trouble academics. Style seemed a little jumpy to me, often, but I give author credit for range of concerns and courage to look at "ordinary" lives in turmoil. I read about half of these short stories. The ones in the beginning were ok, but they got worse and more tedious the farther I went into the book. None of the characters were likeable and often I had the feeling of "what's the point of this story?," and felt bored. Done right, short stories can be very powerful. I think these missed the mark. I read for the phrases, sentences and paragraphs that conjure up whole worlds, and this book has a few: "her Depression-traumatized mother, who wrings the last minim of use from every frayed and stained and unraveling possession.. and "the strangeness of her family strikes her: the forlorn mutual incomprehension of delicate signals continually misinterpreted.." "
There were a couple of stories I hurried through and one I skipped after a couple of pages. I liked the Q and A style of the story “Eros 101,” and would often look back at the question before moving on to the next Q and A passage. My favorite was the final story, "Briar Switch", I'd like to read more about the family depicted. The prose is beautiful for sure, and there's a story about being a literature professor that just captivated me. But a couple of the stories were just too out of reach for me. If there were half stars, I'd give it 3.5. Worth a read for sure! Mind-numbingly complex stories that lost me. Finished a few, skimmed others, and abandoned most. Disappointed, mostly in myself. Elizabeth Tallent's short stories have been published in literary magazines and journals such as The New Yorker, Esquire, Harper's Magazine, The Threepenny Review, and North American Review, and her stories have been reprinted in the O. Henry Prize Stories, Best American Short Stories, and Pushcart Prize collections. She has taught literature and creative writing at the University of California, Ir Elizabeth Tallent's short stories have been published in literary magazines and journals such as The New Yorker, Esquire, Harper's Magazine, The Threepenny Review, and North American Review, and her stories have been reprinted in the O. Henry Prize Stories, Best American Short Stories, and Pushcart Prize collections.